fixes by hand, with hammer and nails, asbestos slates, tiles, or sheets used instead of slates on roof. a slater (q.v.) who works in blue or ordinary slates, as distinct from grey slates; cf. grey slater. covers roof with "felt" before it is slated; and fastens down with hammer and nails. a slater q.v. 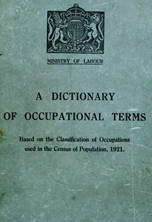 who works in parchester or grey slates; requires more skill and experience in matching, holing and trimming, owing to difficulties of material worked in. a slater or tiler (q.v.) who repairs damaged roofs. instructs carpenter as to correct distance between battens on roof, which depends on size of tiles; nails tiles to battens; trims tiles to fit awkward places in roof, with hammer and chisels or with special cutting tool; fixes and torches ridge tiles, cf. slater. an asphalt layer (579) (q.v.) who spreads hot asphalt brought to him by a labourer, on flat roof, using hand trowel, wooden float, or a similar tool. sorts slates into "clumps," i.e., into groups of approximately equal thickness, and takes care that those in same clump are fixed together, to preserve uniformity; sees that labourer loads roof properly; trims edges of slates with a chopping tool called a "saxe"; marks, with a gauge, places where holes are to be pierced in slates and pierces holes, where indicated, with a spike attached to saxe; attaches slates to roof with hammer and nails; fixes ridge tiles and torches them, i.e., secures them in place by filling interstices with mortar; in repairing roofs, rips out nails from damaged slates with a metal tool known as a "rip," inserts new slates and secures them in position with clips of lead or zinc. a slater (q.v.) who can cut his own slates. lays hot vulcanite on flat roofs; as for sheet asphalt roofer.